THERE&apos;S SO MUCH GOING ON IN OAKLAND that using it as a mere stopover en route to somewhere else doesn&apos;t make much sense. But you can&apos;t look at a map without noticing the city&apos;s proximity to a whole host of pretty amazing places. Here are some ideas for which way to point yourself when you&apos;re finally ready to leave town, or just looking for an epic day trip. Travel time: 3 hours, 39 minutes Follow 1-580 E till 1-205 E. Take CA-120 E, continuing onto Evergreen Rd in Tuolumne County. Bathed in a blanket of snow or dotted with pastel wildflowers, Yosemite Valley is a sight in any season. Wind through the valley and take in the sweeping vistas and wildlife from afar, or participate in outdoor activities such as hiking and fishing. Travel time: 11 minutes Take 1-80 to Gilman St in Berkeley. Take the Gilman St exit from 1-80 E until Eastshore Hwy. Turn onto Gilman St. Situated on the edge of the bay, Berkeleys famed racing track is the perfect way to spend a warm afternoon. Come on a Sunday, when everything costs a dollar; yes, even the beer. Travel time: 45 minutes From 1-880 N, take CA-24 E, 1-680 N, and CA-4 E to Auto Center Dr/Somersville Rd in Antioch. Exit CA-4 E at Somersville Rd. In Mt. Diablos backyard, the preserve offers some 65 miles of trail to explore. Venture deep into the Hazel-Atlas mine to glimpse ancient geological features. Travel time: 3 hours, 6 minutes Take 1-80 E to US-50 E. Continue onto CA-89 S.
To everyone that has ever asked a Californian if they&apos;ve ever seen snow, heres your answer. The popular winter destination holds its own in summer, too, when Tahoe&apos;s forest-enclosed, emerald freshwater lake mirrors the sky overhead. Travel time: 17 minutes Take CA-13 N to the Joaquin Miller Road Exit. Turn right at Joaquin Miller Road and follow signs for Chabot Space & Science Center. As a very hands-on learning experience and the largest public telescope facility in the US Chabot excels in its mission to engage visitors of all ages in science and space education. Travel time: 43 minutes Follow 1-580 W to US-101 S in Marin County. Take the E Blithedale Ave exit. Take a walk through the 100-foot canopies of redwoods, and don&apos;t forget to stop at the park cafeteria for the famed grilled cheese. Of course, make sure to check out Oakland&apos;s own Redwood Regional Park as well. Travel time: 2 hours Take I-580 E, I-680 N, I-80 E, and US-50 E to the Placerville area. The South Fork of the American is one of the most popular rafting and kayaking runs in the western US. With both rigorous rapids and calmer spots, this stretch of the American provides a unique perspective on the Californian landscape. It&apos;s also steeped in history the gold found in the South Forks stream inspired Californias 1849, Gold Rush. Travel time: 5 minutes Exit at Claremont Avenue off of CA-24 E.
A landmark resort and spa, the Claremont is located at the base of Claremont Canyon in the Berkeley Hills (in Oakland), overlooking the beautiful San Francisco Bay. Stop by for tea time to see why the Claremont&apos;s prestigious reputation has endured. Travel time: 1 hour, 9 minutes Follow 1-880 N and 1-80 to CA-37 W in Vallejo. Take the CA-37 exit from 1-80 E. Drive to CA-29 N in Napa County. Californias wine country is second to none in the country. With a whole web of vineyards to choose from, you&apos;re sure to find a blend to your liking. Or, if you don&apos;t want to make the drive, you can find many regional offerings at one of Oakland&apos;s highly rated wine bars and urban wineries. Travel time: 51 minutes Take CA-92 W to CA-1 N in Half Moon Bay. Continue on CA-1 N to your destination in El Granada. True, you can&apos;t actually reach the site of the Mavericks Invitational surf competition without getting a little wet. But the panoramic coastal view of Half Moon Bay is worth the drive. Travel time: 30 minutes Take 1-580 E to 35th Ave, which becomes Redwood Rd as it winds through the hills and leads to the lake&apos;s north shore. For the marina, arrive on the south. Just south of Redwood Regional Park and a quick drive from downtown Oakland, Lake Chabot Regional Park has well-stocked waters that make it a great place for casual fishing, especially for kids / first-timers. You can also take a boat tour, or explore the park via hiking and bicycle trails. Travel time: 28 minutes Get on 1-880 N until 1-80 W to Octavia Blvd in San Francisco. Take Fell St and Kezar Dr to Music Concourse Dr.
One of the largest natural history museums in the world, the Academy of Sciences is an interactive display of wonderment, curiosity, and exploration. Where else can you wander through a rainforest biome and marvel at an albino alligator? Travel time: 2 hours, 3 minutes Follow 1-880 S and US-101 S to CA-25 S in Santa Clara County. Take CA-25 S to CA-146 W in San Benito County. Home to some of the best routes for all skill levels, Pinnacles National Park seems made for climbers. There are also caving and camping options for those who prefer to keep their feet on the ground. Travel time: 55 minutes Take I-580 W and US-101 N to CA-37 E in Novato. Take the CA-37 exit from US-101 N.
From Mexican military outpost to Spanish mission village, historic Sonoma Plaza is California historical icon. Stroll by the duck ponds or circle the plaza for some window-shopping in the surrounding boutiques. Travel time: 5 minutes Take I-80 west out of town. After a long wait, the new eastern span of the Bay Bridge (between Oakland and Yerba Buena Island) opened to much fanfare last fall. The attractive structure includes pedestrian and bike paths, allowing non-motorists to enjoy the striking views of the East Bay for the very first time. Travel time: 2 minutes Exit at Claremont Avenue from CA-24 E. Turn right onto Telegraph from Claremont. Home of many historic counterculture protests of the 1970s, Telegraph continues to attract conscientious citizens and students championing social causes. It also has some excellent restaurants, particularly those serving Ethiopian cuisine. Travel time: 1 hour, 4 minutes Take I-880 S, I-238 S, I-580 E, Crow Canyon Rd, and Diablo Rd to Mt Diablo Scenic Blvd in Blackhawk. Mount Diablos famous double pyramid caps out at almost 4,000 feet. The Bay Area landmark gives remarkable views of the region on a clear day, you can see the Sierra Nevadas on the far eastern horizon. Travel time: 1 hour, 24 minutes Follow 1-80 E to CA-29 N/Sonoma Blvd. The car ride to Calistoga may be a breezy trip, but it still warrants a little R&R. Revitalize yourself with a mud bath, massage, or dip in the hot springs at one of the many spas in the area. Travel time: 1 hour, 54 minutes Follow I-880 S and US-101 S to CA-156 W in Prunedale. Take the exit toward Monterey/Peninsula from US-101 S. Follow CA-1 S to Del Monte Ave in Monterey. Exit at Del Monte Ave off of CA-1 S.
A real-life Finding Nemo, the Monterey Bay Aquarium exhibits an impressive variety of marine life from stingrays you can touch to luminescent jellyfish, kelp forests and, of course, sea otters. Travel time: 2 hours Catch the Amtrak Capitol Corridor train from downtown Oakland. Bringing to life the golden days of railroad travel, this museum features 19 steam locomotives and interactive educational programs. Even better, you can get there via Amtrak&apos;s Capitol Corridor service. Catch the train in Jack London Square and two hours later you&apos;re in downtown Sacramento, a short walk from the museum. Travel time: 45 min Drive on CA-84 W until you hit US-101 S in Menlo Park. Take the Rengstorff Avenue exit in Mountain View. Dive into the heart of the digital world at Googleplex in Mountain View. You&apos;re sure to leave inspired to create a new app. Don&apos;t worry, this is a common side effect of visiting Silicon Valley. Travel: 1 hour, 26 minutes Take the Suisun Valley Rd/Pittman Rd exit from 1-80 E. Follow Suisun Valley Rd to CA-128 W in Napa County. Drift over the elaborate patchwork quilt of vineyards that comprise Napa Valley. Take in the rolling hills and expansive greenery, culminating in a tasting or two at the wineries below. Travel time: 14 minutes Exit at Claremont Avenue from CA-24 E. Take College Ave to Gayley Rd. UC Berkeley&apos;s outdoor amphitheater has hosted multi-genre musical legends and motivational speakers (such as the Dalai Lama) for over a hundred years now. Travel time: 2 hours, 18 minutes Take 1-580 E and 1-205 E to CA-120 E. Take CA-108 E to Jackson St/Yankee Hill Rd in Columbia. 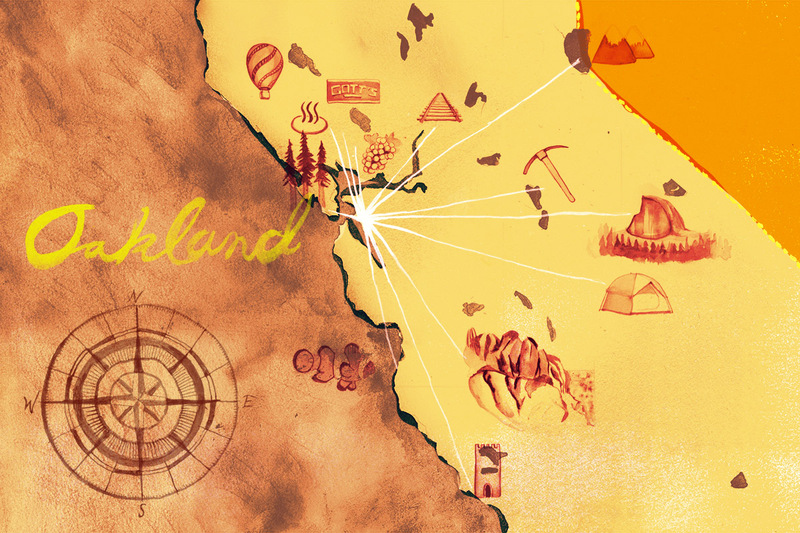 Experience your own taste of gold fever as you immerse yourself in historic gold country. For an authentic experience, visit Columbia State Historic Park just north of Sonora. From the traditional garb to the stagecoach rides and panning for gold, you&apos;ll be hooked in no time. Travel time: 1 hour 1-580 W to US-101 S. Exit toward Stinson Beach from US-101 S, following CA-1 S to Panoramic Hwy. Every spring atop Marin County&apos;s landmark Mt. Tamalpais brings a unique theatrical tradition the Mountain Play. Pack a picnic, lather on the SPF, and settle into the stone rows built into the mountainside. Not a fan of musicals? Just enjoy the one-of-a-kind view of the bay. Travel time: 3 hours, 40 minutes Take US-101 S to CA-46 W/Green Valley Rd in Paso Robles. Take the CA-46 W exit from US-101 S. Follow CA-46 W/Green Valley Rd and CA-1 N to Hearst Castle Rd. Both a National and California Historical Landmark, Hearst Castle is the embodiment of early-20th-century excess. Lavish and opulent (56 bedrooms! ), the estates impressive architectural features and extensive art collection are open to the public for tours and gawking. Travel time: 33 minutes Follow I-880 N and I-80 to CA-37 W in Vallejo. Take the CA-37exit from I-80 E.
This 135-acre amusement park showcases animal attractions in addition to the usual Six Flags roller coaster thrills. Head to the water rides for an opportunity to cool down after your day of fun in the sun. Travel time: 3 hours, 18 minutes Follow 1-580 E to 1-205 E and then CA-99 S. Get on CA-140 E, exiting at Red Bud in Madera County. Bass Lake is a popular destination for water recreation and camping in the Sierra Nevada foothills just south of Yosemite. Rent a boat or jet ski, or just enjoy the sandy beach shores that line the lake. Travel time: 1 hour, 9 minutes Drive on 1-80 E until CA-37 W in Vallejo. Merge onto CA-29 N in Saint Helena. Gotts Roadside (formerly and fondly known as Taylors Refresher) takes everybody&apos;s favorite American drive-in to a wonderful new level. Locally sourced California ingredients, the winery town of St. Helena as its backyard...Gotts makes for a worthy day trip from Oakland. Try the ahi burger. Travel time: 2 hours, 12 minutes Take 1-880 S to US-101 S. Get on CA-1 S in Monterey County. That iconic arched bridge you always see in photographs and car commercials? Yeah, that&apos;s the Bixby Bridge. With a stunning panorama of the Pacific Ocean and Central Californias lush coastal cliffs, Bixby Bridge is one span of road that itself is worth a drive.